Easily simulate fluid flow, heat transfer, and fluid forces that are critical to the success of your design with SolidWorks Flow Simulation. Fully embedded with SolidWorks 3D CAD, SolidWorks Flow Simulation intuitive CFD (computational fluid dynamics) tool enables you to simulate liquid and gas flow in real world conditions, run “what if” scenarios, and efficiently analyze the effects of fluid flow, heat transfer, and related forces on immersed or surrounding components. You can compare design variations to make better decisions to create products with superior performance. Driven by engineering goals, SolidWorks Flow Simulation enables Product Engineers to use CFD insights for making their technical decision through a concurrent engineering approach. Additional HVAC and Electronic Cooling modules offer dedicated fluid flow simulation tools for detailed analysis. SolidWorks Flow Simulation comes with a range of features and capabilities to help you improve your design. Below is a list of some of its powerful features that you could benefit from – along with some useful information, if you require any more information feel free to contact us. Tightly integrated with SolidWorks CAD, CFD analysis using SolidWorks Simulation takes the complexity out of flow analysis and can be a regular part of your design process, reducing the need for costly prototypes, eliminating rework and delays, and saving time and development costs. Understand and evaluate thermal comfort levels for multiple environments using thermal comfort factor analysis with SolidWorks Flow Simulation and the HVAC Application Module. 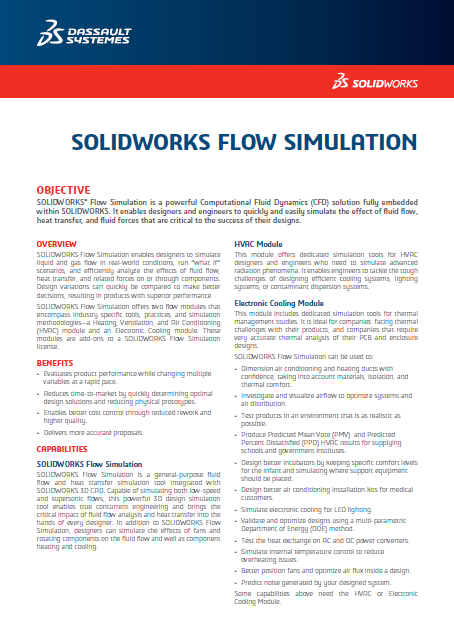 Tightly integrated with SolidWorks CAD, thermal comfort factor analysis using SolidWorks Flow Simulation can be a regular part of your design process—reducing the need for costly prototypes, eliminating rework or delays, and saving time and development costs. Evaluate and compare design alternatives with the visualization and reporting capabilities of SolidWorks Simulation. Increase your ability to make informed design decisions while you ensure product performance and safety. Tightly integrated with SolidWorks CAD, SolidWorks Simulation analysis visualization and reporting can be a regular part of your design process—helping to reduce the need for costly prototypes, eliminate rework or delays, and save time and development costs. Easily investigate the impact of cooling and design changes on component temperatures using thermal fluid analysis in SolidWorks Flow Simulation. You can quickly determine the impact of fluids flowing in and around the design to ensure correct thermal performance, product quality, and safety. Tightly integrated with SolidWorks CAD, thermal fluid analysis using SolidWorks Flow Simulation can be a regular part of your design process—reducing the need for costly prototypes, eliminating rework or delays, and saving time and development costs.